The Rolex Submariner is a world-class watch with a long history of excellence that not only defines the Submariner, but the Rolex company in itself. Rolex debuted the Submariner in 1953 as a divers watch, and despite getting minor tweaks over the years, its iconic design has remained largely unchanged over the years. Rolex’s goal with the Submariner was to create a watch that had peak performance underwater, but also flawless design that would enable it as an exquisite timepiece for everyday use. 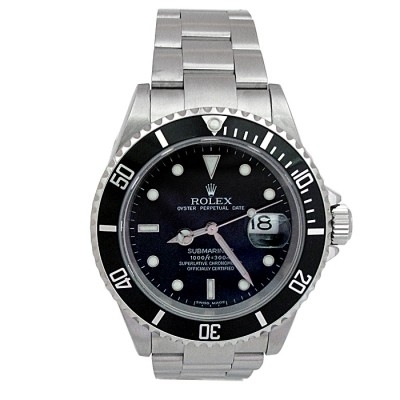 Today, the Rolex Submariner is revered around the world for those very attributes. Having been worn by some of the world’s most famous on-screen and real life celebrities including James Bond, Bruce Springsteen, and Steve McQueen, the Submariner has become one of the most popular Rolex watches of all time. In this article, our experts at WatchesAndWatches.com give you an inside look at some of our favorite Rolex Submariner models, providing you with all the details you need to know about this classic watch. 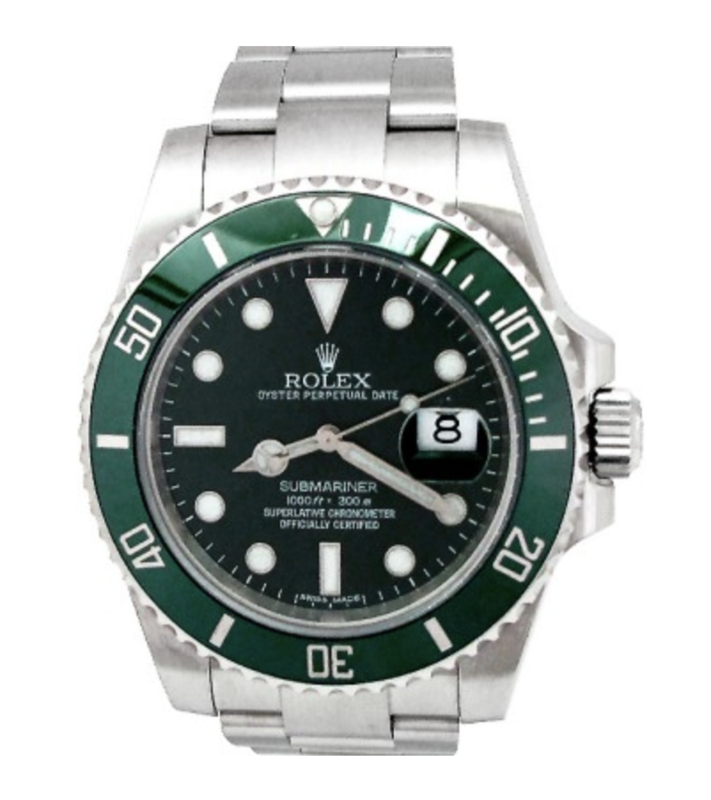 Rolex released this version of the Submariner as a special anniversary edition, making good use of Rolex’s signature green color. In a short time, it has come to be known as a collector’s item amongst Rolex collectors due to its one-of-a-kind design that takes the classic design of the Submariner to new levels. The watch features a matching green bezel and dial that are perfectly complemented by the white luminescent hour markers, creating a flawless design that will immediately make it your most beloved watch. Three words can be used to perfectly describe this Submariner: simple, refined, and timeless. The Submariner Ref. 16610 offers us a watch that has the functionality to be worn on an everyday basis and the style that makes it the quintessential accessory which can finish off any outfit, whether casual or formal. The sleek black bezel and dial are understated design features that will never go out of style. The stainless-steel Oyster band brings this watch together splendidly, creating a Rolex watch that symbolizes everything we love about the legendary company. If you’re in the market for a Rolex that is unquestionably bold and makes a statement, then there is no better option than this two-tone Rolex Submariner that features an irresistible diamond dial. 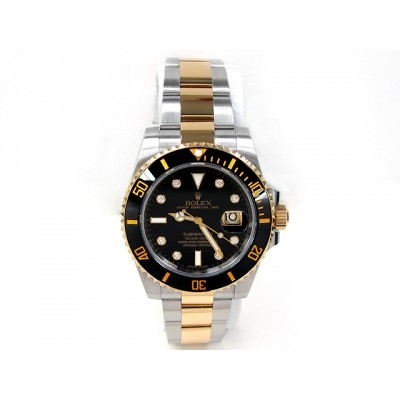 With this watch, Rolex makes very good use of a two-tone color scheme that incorporates 18K gold throughout the watch. Rolex’s signature Oyster band sets the tone for the watch with a 18K gold and stainless steel combo that is elegant and alluring. The dial, however, is undeniably the centerpiece of the watch, with a lavish 18K gold and black display that is hard not to love. Finally, glimmering diamonds that are incorporated into the dial on eight of the hour markers add a dash of shine that makes this a Rolex like none other. 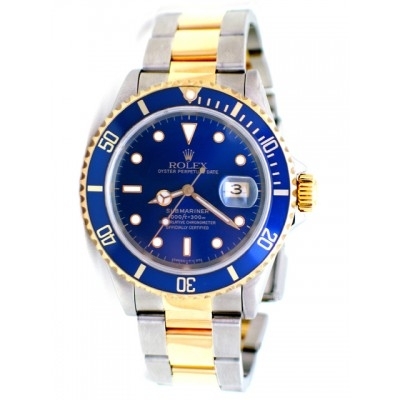 If you like the idea of a two-tone color combo, but black and gold just wasn’t your favorite, then consider this beautiful Submariner with a gorgeous two-tone 18K gold and blue dial. This watch has the same snazzy influence found in the previous watch, but is not as out there and retains a more refined design. A 18K gold and stainless steel Oyster band is paired with an ocean-blue dial that showcases subtle 18K gold accents (our favorite being the 18K gold pair of hands). As a top-of-the-line Rolex watch that boasts a color combo that has become more and more popular in recent months, we feel this Submariner is the true gentleman’s Rolex. WatchesAndWatches.com is the premier destination for fine jewelry and watches, listed with the Jewelers Board of Trade (JBT) and International Jewelry and Watch Guild (IJWG), and Watch & Clock Association. We specialize in bringing our customers the top timepieces at the best prices available on the market, and strive to guarantee customer satisfaction in any way we can.